Source: Physical ARC received via the publisher in exchange for a fair and honest review. Upon finishing A Court of Thorns and Roses, I knew it would stay with me for quite some time. I read this in December and I STILL have ALL THE FEELS. Not only has this become one of my new favorite books, but I honestly think it will become an ALL TIME favorite. It is THAT good. I loved every minute and I was beyond devastated when it was over. I wanted more. No, I CRAVED more. I am already a huge Sarah fangirl so waiting for her books is the most painful kind of torture. I actually didn't realize this was a Beauty and the Beast retelling until I was done. Hah. I finished and was not only reminded of Beauty and the Beast, but I caught a hint of the Persephone myth in here too! (I don't know if that was intentional or not. I think I'll ask Sarah tonight!) 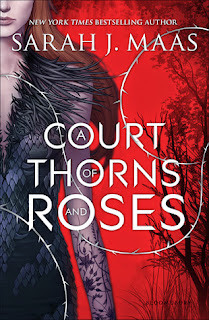 I loved the way Maas crafted this story, developed the characters and their relationships, and made me feel I was right there in Prythian experiencing everything as Feyre did. I loved Feyre. She isn't a kickass warrior like Celaena, but she has her own strength and resilience. And she's got a hell of a lot of heart. I really admire her for taking care of her family the way she did, especially with the way they acted. She has become hardened by the life she lives and lives in the now. She doesn't daydream like her sisters or act as if things are going to magically get better. She's a realist through and through. She is not happy about the arrangement to go and live with Tamlin in the Faerie Lands, but she is without a choice. She must cross into enemy territory if she wants to live and there, she must adjust to her new life among these ethereal masked faeries. Let's talk about my new book boyfriend, Tamlin. I am so in love with him, it's kind of scary. Even though he is angered and upset over the loss of his friend to Feyre's hands, he still shows her compassion and kindness. He made me swoon so very much and I loved watching them warm up to one another. This is the best kind of hate-love relationship. He made my toes curl and my stomach flutter and I was flailing by the time we got to some of the more steamy scenes. I really liked Lucien as well, Tam's best friend. He ended up being a great friend to Feyre as well and I loved that he provided some comedic relief. Now, Rhys on the other hand... I know tons of people love him and I think I would too.... had I jumped into my time machine and read the next books. LOL. I have no idea where Sarah is going to take her story next, nor her relationships, especially after the events that transpired at the end of the book. Where Tam is light, Rhys is dark. He's definitely got that bad faerie vibe going on, but I am curious about him. We got to see some of his vulnerability, so I am interested in seeing how this storyline will play out. And terrified because my heart might not survive this series. To sum up my somewhat erratic thoughts and feelings, I loved this book to pieces. I love that Sarah isn't afraid to be bold and make things happen. The steamy scenes had me in full swoon mode and I am almost embarrassed at how many times I reread them. (Almost, but not quite.) I am so invested in these characters and their lives, as well as the story she has created. If you're a lover of high fantasy, then I definitely recommend this one and I hope it captivates you with its beauty as much as it did me. This book is everything and I adore it and like you months later I am still thinking about it. I need to work in a re-read soon because I miss Tamlin. I love Rhys too and I am super curious about him, but my heart belongs to Tamlin and I will sob if things dont work out the way I want them to. Awesome review! I finished this book just before it came out and I haven't stopped thinking about it since! When I think back on it I can see all the things that I love about it but I can never pin point why I loved it that extra bit but I just did and now I have to wait a year along with many other people for the second book and it torture! SQUUEEEE! Tamlin! <3 I loved that boy so much. And OMG when he growled! ;) Definitely very hot. I really liked Feyre too and I think I may have enjoyed her a little bit more than I did Celaena because she was more relateable to me. But seriously, if the next book turns into a love triangle I'm going to cry. I don't want that happening to my ship.